Wildlife veterinarian Mark A. Mitchell reports on how our instinctive fear of snakes and other reptiles leads to neglect and mismanagement. Wildlife veterinarian Mark A. Mitchell reports on how our instinctive fear of snakes and other reptiles leads to neglect and mismanagement. He believes the federal ban on sales of turtles less than 4 inches long represents a double standard. Legislation to overturn the ban on sales of tiny turtles, already passed by the Senate, is pending in the U. S. House. Mitchell was interviewed by News Bureau Life Sciences Editor Diana Yates. The sale of turtles under 4 inches long ended in 1975 when health officials warned that the turtles were infecting some children with Salmonella bacteria. How did you get involved with the issue? My Ph.D. was exploring Salmonella in green iguanas. Historically, people have given reptiles a bad rap because of Salmonella. My belief is not that the reptile is bad; it's the fact that humans keep them in captivity. Several studies have shown that the prevalence of Salmonella in wild reptiles is actually very low in most cases. It becomes very high in captivity because we congregate the animals. That mimics things like poultry. It's funny that in poultry Salmonella is an accepted concern but in reptiles it's not accepted. I think that what we potentially eat three times a day should be more of a concern than an animal that may or may not get held. It's easier to tell people how to wash their hands than it is to get them to prepare food correctly. How can the risks of Salmonella from pet turtles be minimized? To house these reptiles correctly should cost about $200. That's what we should be promoting. The idea is not to fall back to the old ways, because people were feeding the turtles chicken, hamburger, dried flies... Now we have Salmonella-free turtle chow that we can offer. And we know that reptiles need to be housed at a certain temperature. We know all these things that historically pet owners didn't know. Are you concerned that these pets are targeted at small children? The Food and Drug Administration reported that - prior to the ban - 280,000 cases of sickness in young children were tied to Salmonella from small turtles. That number was based on a case control study from the 1970s. That was an estimate. There were not 280,000 cases. They also say there was a 70-plus percent reduction in cases after instituting the ban. The reduction in cases was based on a limited number of confirmed cases, from about 200 to about 70. Now, granted, some people might say, "Two hundred! That's kind of high!" But how many other risks are out there? That were traced back to turtles? Well, kind of. Part of the problem is they were looking at things like Salmonella Enteriditis, which actually probably was coming from the chickens that were being fed to the turtles. Of course I do think it's a concern. As an epidemiologist, a veterinarian, I'm a public health official. But I don't like when people say that there were "280,000 cases." They need to realize that those numbers were estimates, not confirmed cases. The Centers for Disease Control currently estimates that there are over 2 million cases of food-borne salmonellosis per year. You might think because of those numbers that there would be strict regulations on how foods are managed, when in fact there are very few restrictions. For produce, the FDA - the same agency that restricts the sale of turtles - only requires food producers to follow guidelines. No restrictions. Even with highly publicized food-borne outbreaks, such as the spinach and Taco Bell outbreaks in late 2006 and early 2007, there have been no hard-and- fast regulations on these products. Your work goes well beyond turtles. 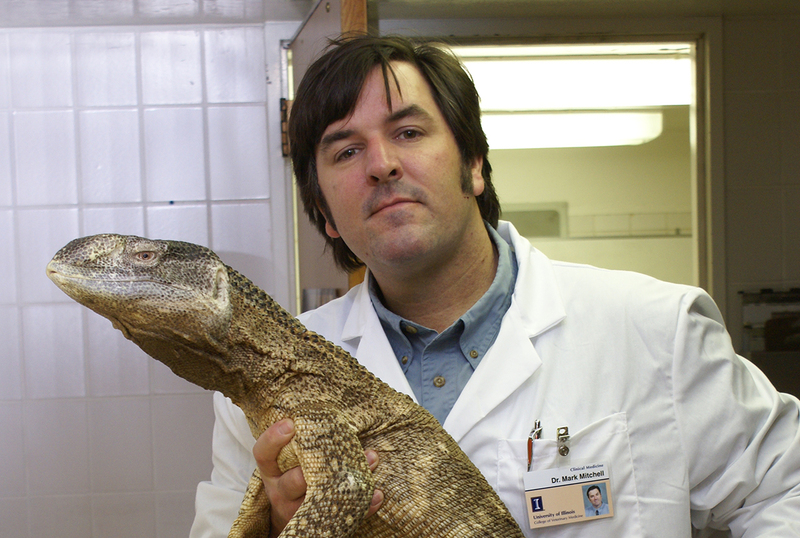 Is it common for a wildlife veterinarian to be involved with so many species? I've been the kid who has been interested in animal life my whole life. I'm fascinated with everything and I have quite an eclectic collection of animals in my own house – all rescues – from my dogs and cats all the way down to my hissing cockroaches.